After lonely divorcé Isaac leaves his job as a banker to work as a conservationist on a country river, he gives up on finding the love he always wanted. Then he meets flirty jeweler Ryan and assumes Ryan’s out of his league, but Ryan’s just as lonely as Isaac. Ryan also has the housemates from hell, and when he storms out of the riotous Christmas party they forgot to warn him about, he soon finds himself lost in the snow. Ryan passes out in front of the lock cottage where Isaac lives, and once Isaac brings him in from the cold, they finally have a chance to get to know each other. 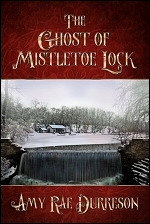 But when their insecurities get in the way, it’s up to the ghost of Mistletoe Lock to ensure they give love a chance. EMILY had drowned on a day like this, when the snow fell softly from the steel-gray sky and the water roared through the weir. Her husband had pulled her from the ice-flecked water, the tears cold on his ruddy, honest face. What are they saying on Goodreads? What are they saying on Booklikes?